Police officers redirect traffic in the Belgian city of Liege on Tuesday, May 29, 2018, near the site where an armed man shot and killed police officers before being subdued by police. The NYPD is reminding all of its officers to “maintain strong situational” awareness after a terror attack in Belgium targeted police officers there Tuesday. Two female police officers in Liege were repeatedly stabbed in the back by a terrorist who then took the officers guns and shot them. The suspect then went on to take a hostage at a nearby school before being killed during a shootout with responding police. 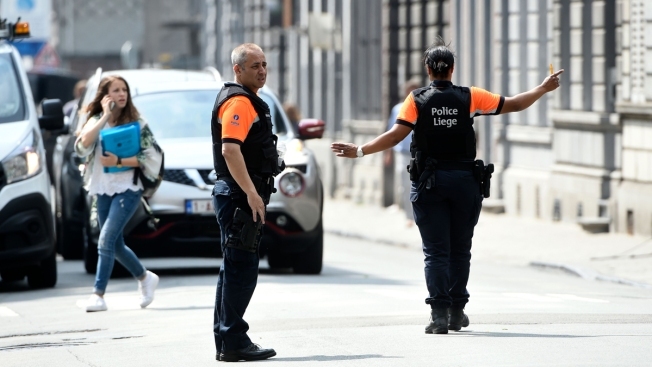 Belgian police identified the suspect as Benjamin Herman, who was given a two-day furlough as part of a rehabilitation program. Herman, 36, is a drug suspect turned radical Islamist, authorities said. Witnesses said he screamed “Allahu Akbar” as he attacked the officers. Belgium authorities are calling the incident a terror attack. Officers Sorayay Belacemi and Lucile Garcia were killed. Four other officers were injured during the shootout. The NYPD has seen its own officers targeted in recent years. In October 2014, a hatchet-wielding Zale Thompson attacked a group of rookie NYPD officers as they posed for a photo on a Queens street. The incident was called a terror attack by police. In a separate December 2014 incident, two New York City police officers, Wenjian Liu and Rafael Ramos, were shot and killed as they sat in their patrol car.